Toast fennel seeds in a frying pan over medium-low heat until fragrant, approx. 2 min. Add cranberries to a food processor along with flaky sea salt, chili flakes, garlic cloves, toasted fennel seeds, olive oil, sage leaves, rosemary, and dried cranberries. Blend into a paste and set aside. Butterfly the piece of pork belly, making sure to leave one edge intact, and equally distribute the cranberry and herb paste over the pork. Roll pork belly into a log and use kitchen twine to tightly tie it up, leaving about 3/4-inch/2-cm of space between each section. Transfer the rolled pork to a baking dish and leave in the fridge for at least 12 hrs., or overnight, for the skin to dry out. On the next day, take the meat out of the fridge an hour before cooking to bring it down to room temperature. Preheat the oven to 220°C/425°F. Transfer pork belly to a baking sheet and pat off any moisture on the skin, then transfer baking sheet to the oven. Reduce heat to 180°C/350°F after approx. 30 min., and roast for approx. 1.5 – 2 hrs. more. To make the skin extra crispy, switch the oven to highest grill setting. Use tongs to rotate the pork three times to brown all the sides evenly, approx. 3 – 5 min. Be sure to stand by the oven door and watch as the skin can burn very quickly. Remove the pork from the oven, cover loosely with aluminum foil and allow to rest for approx. 10 min. 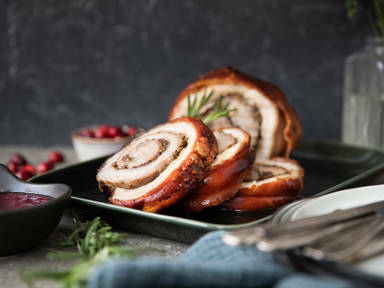 Remove aluminum foil, thickly slice rolled pork belly, and serve with cranberry sauce. Enjoy!